Boil the pasta in water with a dash of olive oil to avoid sticking. When the pasta still has a good bite, take if off the heat, drain it and set aside covered. Heat the olive oil in a large frying pan, add garlic and fresh thyme. Cook for 1-2 minutes, then stir in all mushrooms and season with salt and fresh ground black pepper to taste. Fry the mushroom mix over high heat for 3-4 minutes until slightly brown, and then mix it with the pasta. Toss it together and serve with parmesan (soy parmesan for vegan version). 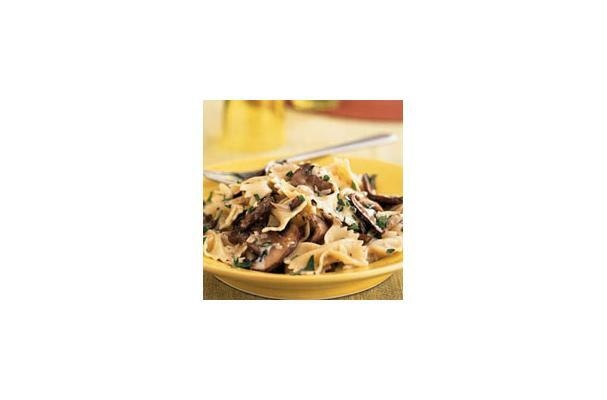 This pasta recipe with wild mushrooms really satisfies with its full, earthy taste.